What were Voltaire’s religious views? “God is, or He is not.” But to which side shall we incline? Reason can decide nothing here. There is an infinite chaos which separated us. A game is being played at the extremity of this infinite distance where heads or tails will turn up…. Which will you choose then? Let us see. Since you must choose, let us see which interests you least. You have two things to lose, the true and the good; and two things to stake, your reason and your will, your knowledge and your happiness; and your nature has two things to shun, error and misery. Your reason is no more shocked in choosing one rather than the other, since you must of necessity choose…. But your happiness? Let us weigh the gain and the loss in wagering that God is…. If you gain, you gain all; if you lose, you lose nothing. Wager, then, without hesitation that He is. In other words, if we don’t know whether God exists, we have two choices. We can base our life on the premise that he is. In that case, if he exists, we will go to heaven. But suppose he doesn’t exist? It’s still better to bet that he is, because if he isn’t, we lose nothing. Whereas, if we bet that he isn’t and he isn’t, we are merely confirmed in our misery, but if he turns out to exist, we go to hell when we die. Voltaire would have none of this. Voltaire believed that the design evident in nature was proof of God’s existence, as First Cause, Prime Mover, and Supreme Intelligence. However, he thought that God was indifferent to human concerns, and tried to resolve the problem of evil: How can a benevolent and omnipotent God permit evil to exist? 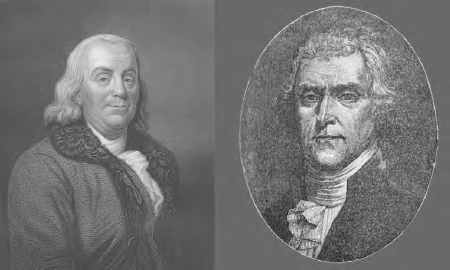 Founding Fathers of the United States such as Benjamin Franklin (left) and Thomas Jefferson were energized by the Age of Enlightenment and the flourishing ideals of liberty and democracy (iStock).